Slow Food USA's National School Garden Program (NSGP) aims to reconnect youth with their food by teaching them how to grow, cook and enjoy real food. Through increased confidence, knowledge gain and skill building, we want to empower children to become active participants in their food choices. By becoming informed eaters, today’s children will help make a positive impact on the larger world of food and farming well into the future. The goal of the NSGP is to support local Slow Food chapters in sustaining school garden programs in their community, serving as a local hub of important resources and as a connector that facilitates partnerships on the ground. The Boston chapter of Slow Food is an active participant in the NSCP. 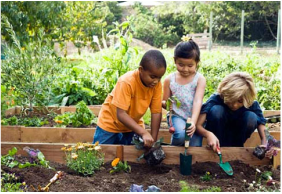 An upcoming School Garden Summit, and School Garden Conference in February 2016 with bring together stakeholders, experts and practitioners to share experiences and brainstorm solutions to challenges in the realm of sustainable gardens in the school community. We grow community around school gardens by providing technical assistance, resources and partnerships to cultivate the next generation of healthy eaters of good, clean and fair food.